Download this free crochet ripple blanket and cushion pattern today! It's Christmas Eve! Are you all set for the big day tomorrow? We know it's early, but we've got you something. 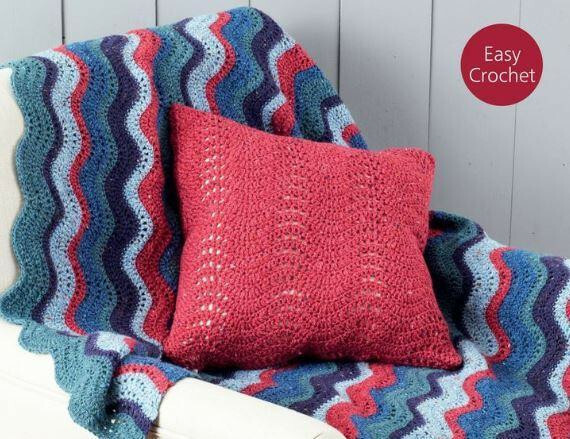 Whether you're an avid crocheter or have always wanted to learn, you can download this simple Sirdar crochet ripple blanket and cushion pattern for free, exclusively with us. Crocheted in Sirdar Harrap Tweed DK, the project has a beautifully blended colour palette, inspired by the Yorkshire surroundings of the Sirdar Head Offices in Wakefield. As with all Sirdar projects, any DK weight Sirdar yarn will work to the pattern tension, so you can choose your favourite and create something just for you. If you've always wanted to learn crochet, check out our easy-to-follow 'How to crochet' guide for step-by-step instructions. Once you've mastered the basic stitches, you'll fly through this project in no time. Don't forget, when you're shopping for the yarn to make your blanket and cushion, you can find the best available prices with us here. We regularly price match our competitors to bring you unbeatable value. Plus, all our parcels are sent in eco-friendly packaging, and all orders placed by 4pm are despatched on the same working day. Download your free pattern today and have a very Merry Christmas!